In previous years, there have been many earthquakes that have hit the country and left a tragic impression. The country is still replenishing from the after-math of those natural disasters. Be it 26th January, 2001 or any other incident, there could be nothing worse than this act which devastated a million lives and property at the same time. 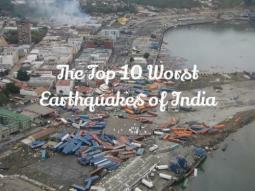 Here is a list of the 10 Worst Earthquakes of India. Extreme scale of destruction is the worst memory of this earthquake. Islands in the middle of this ocean disappeared. The weirdest thing to remember about this calamity was that the newspaper initially only wrote about this incident as a tsunami. It gave it maximum coverage leaving business and sports pages. These were a large scale destruction that took place on the following day of Christmas. Pakistan suffered more in this calamity as compared to India. The epicenter of the quake remained in Muzaffarabad, Pakistan. Its magnanimity could be understood by the fact that even neighboring countries including China, Afghanistan, and Tajikistan felt the worst tremors. Relief material flowed in from every part of the world. A good memory was that the Indian Army helped in a big way by aiding to clear all the debris and distributed relief material. They also maintained medical camps in Pakistan as well as in India.